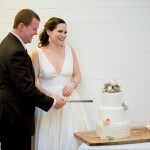 Amber & Joshua were married at the Gympie Conference Centre on a beautiful, and rather warm autumn day earlier this year. 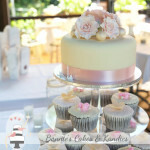 They chose a cutting cake and cupcake tower for their wedding cake, and it is my pleasure to share some images below! 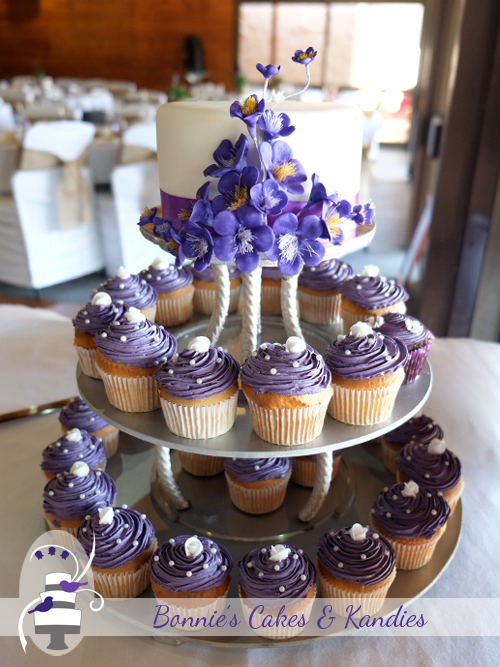 Decorated with deep purple handmade icing blossoms, the cutting cake was made in a gluten free macadamia cake, and covered with my handmade white chocolate fondant. 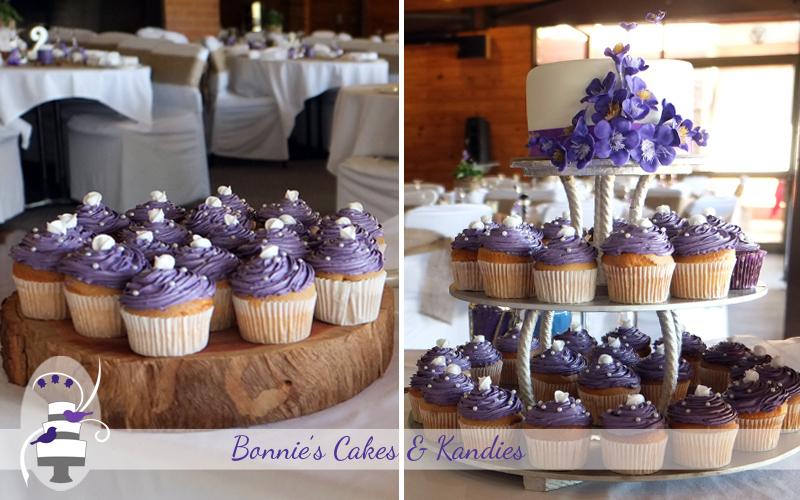 Amber & Joshua chose to display some of their cupcakes on one of my cupcake stands, with the remaining cupcakes set on a raw timber slab beside the stand to complement the decorations in the reception room. The gorgeous couple used rustic elements such as raw timber and burlap, combined with softer touches of fresh flowers and lace in their decorating to create a beautiful reception with an elegant and inviting atmosphere. 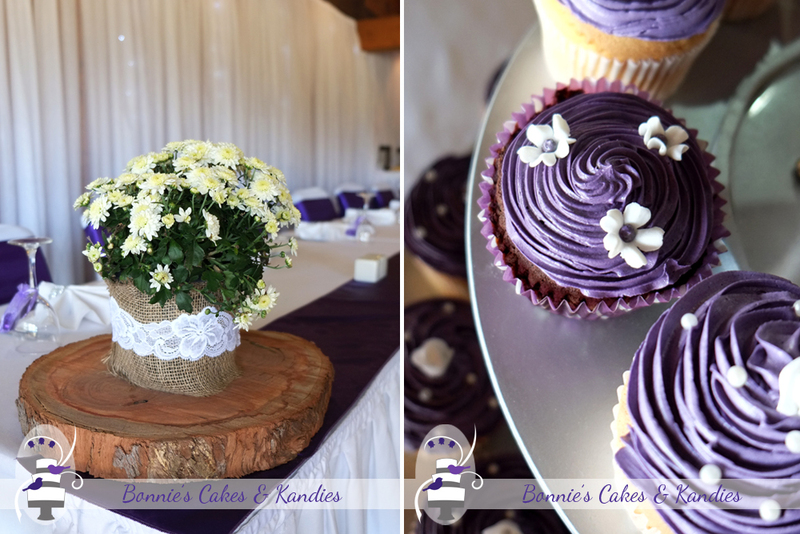 The vanilla sponge cupcakes were iced with a swirl of purple-coloured white chocolate buttercream. 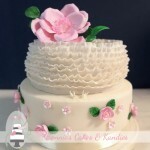 White piped rosebuds were placed in the centre of each buttercream swirl, with edible pearls placed around to finish. 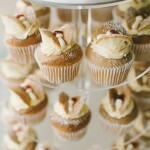 One of the guests received her very own vegan chocolate cupcake (pictured above). I made three little icing blossoms for the decorations to ensure that the cupcake was suitable for a vegan diet, and used a different coloured paper case to ensure it would stand out from the regular cupcakes. 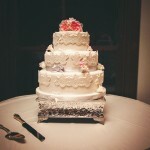 Thanks to Anthony Cooper for capturing a photograph of me piping my signature lovebirds onto the top of the cutting cake during set-up on the day! 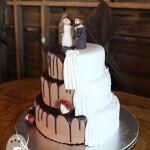 To Amber & Joshua – what a great pleasure it was to meet you and make your wedding cake and cupcakes – thank you! I wish you the absolute best of times on your journey through life together.